This year the 24 Hours of Le Mans will become a bit more crowded in the top LMP1 class. Next week the Nissan GT-R LM NISMO will take a very different design to compete against Audi, Porsche and Toyota. It will be very interesting to see how the front-engined front-wheel drive car is able to do against mid-engined hybrids with all-wheel drive. The Japanese automaker has a good history in the race, but they would like to get to the top. Audi and Porsche will likely be the toughest challenges, but in a 24 hour endurance race you never know what might happen. To find out more about Nissan at Le Mans as well as more from the drivers of the GT-R LM NISMO click past the jump (or scroll down if you came directly to the full article). Have Top Level Le Mans Cars Gotten Uglier? Nissan has announced that the number 21 Nissan GT-R LM NISMO will compete using a special livery at the 24 Hours of Le Mans. The front-engined racing machine will commemorate one of the greatest endurance cars that the Japanese manufacture has ever produced. Back in 1990 the number 24 Nissan R90CK managed a 3:27.020 lap of the Le Mans circuit. That was fast enough to put it on the pole position for the legendary 24 hour endurance race. Beyond this it did so looking very good, which may not be something the new GT-R LM NISMO can say. To find out more about the R90CK and how newer race cars have become uglier, click past the jump (or scroll down if you came directly to the full article). The end of the World Endurance Championship (WEC) season is fast approaching. One of the last races of the season is the 6 Hours of Bahrain. The Middle-Eastern endurance race was a good one of Porsche. As most probably know, the German performance car maker is competing with their new Porsche 919 Hybrid LMP1 car. The new race car marked the return of Porsche to the top level of competition at Le Mans. The famed 24 hour race is part of the WEC season and in the first year of the car has proven tough competition for Audi. This video shows highlights from the 6 Hours of Bahrain. In the race Porsche managed to get two on the podium for the overall race. 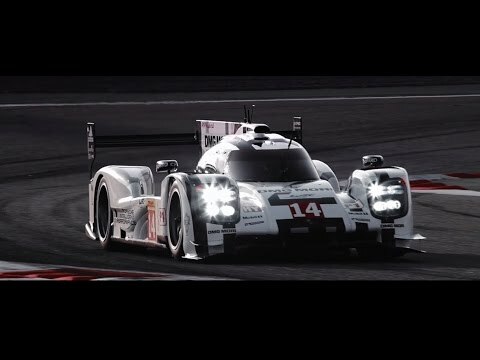 When we talk about the Porsche 919 LMP1 race car we usually talk of the technical advancements. These include things such as it’s hybrid system, but we don’t normally talk about the steering wheel. While it is somewhat similar to what is used on F1 cars, the steering wheel has a computer on it to tell the advanced car exactly what it’s driver wants to do. Although it is called a wheel you’ll notice that it is flat. The reason for this shape is to help make driver changes easier, especially with taller drivers. The wheel has 24 buttons on it and six paddles. One of the most used buttons is the red button on the top left. It should be labeled “go baby go” as it is what is used to give the car it’s electric motor boost. The controls were carefully positioned with the help of the drivers. It is very important that a driver know where everything is quickly as it could help them win a race or get out of a tricky situation. Below is even more information about the wheel. The red button at the top left is also highly frequented. It is used to demand electrical power from the battery, the so-called “boost”. The drivers can boost to pass but must be clever about rationing the power. The amount of energy per lap is specified. The yardstick is one lap in Le Mans, where six megajoules are available. The amounts are converted accordingly for shorter circuits. The amount of energy a driver uses in the middle of a lap to get free of the traffic will not be available at the end in the straightaways. The two rotary switches called ‘Multi’ correspond with one another. The left one is available for ABC settings, the right one is number-based. Programmes for engine management or fuel management are designated by combinations such as A2 or B3. Three other rotary switches are available to pre-select the brake balance, set the traction control for wet or dry conditions and the hybrid strategy. To make the switches easier to recognise in the dark, their colours are fluorescent and respond to a black light lamp, which is situated above the driver’s helmet.